Not only about the Mental Game or Sports Psychology, but one of the best books I've read in personal development. From the start it dives right into applicable skills, scenarios, affirmations, and awesome quotes. 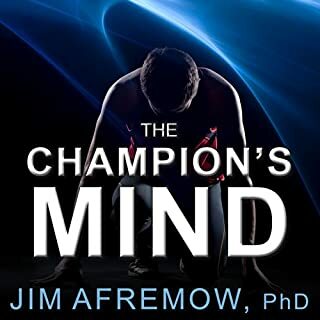 This book is not only a book on Championship thinking for Athletes but also for business professionals, leaders, and daily life. Dr Afremow looks at every challenge as an opportunity for growth no matter the circumstance and staying present to achieve success on and off the field. I began applying some of the skills immediately as I was going through the book. Something simple as listening to a certain type music to get into the rhythm and flow of an activity can determine how well we focus especially during a difficult period of a day i.e. mid afternoon for me. And that rhythm and flow can be applied to our sports practice or performance. Even the pre-game prep is something many of us overlook in the importance of creating an environment that'll boost our performance rather than create resistance and stress. Highly recommended reading and/or listening. See more below for additional review. Great reader. Voice and level of enthusiasm was just right for this book. One of my favorite quotes from the book is "The goal for any Athlete is to be Master of the injury rather than letting the injury master the Athlete. Bring your champion's mindset to the training room and make rehab your new sport until you get your game back, and you will get that game back." Reminds me of what I did during my recovery after spine surgery. If it wasn't for my mental game and making rehab my sport and part of my daily fitness activity, I wouldn't have recovered as quickly and as well as I did while discovering a new passion. If you think about it, your Physical Therapist during rehab becomes your Strength Coach. Their goal is to get you back in the condition you were at pre-injury through exercise.